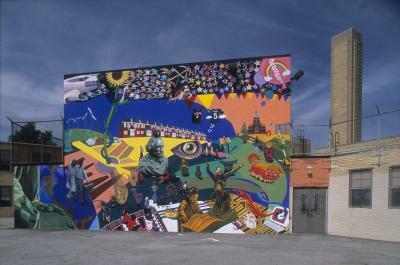 This mural was created as part of the Mural Arts Program's multi-year/multi-mural partnership with the School District of Philadelphia. The school requested a mural about the theme of immigration because the student population at Spruance is made up of many different ethnicities. The mural includes symbols from various cultures and religions, and some of the children from the mural class (a curriculum provided by the Mural Arts Program in concert with the project) actually modeled for the mural. The Statue of Liberty is depicted (corner, lower left side) with the chains around her foot broken symbolizing freedom. The houses in the background represent the neighborhood. There is also the "American Eagle" (you can find it if you see its eye in the middle of the mural and follow it around), and a family with suitcases and an airplane, representing opportunity, and traveling to a free land.